It's a unique fishery. A rare species of black bass that grows to over 8 pounds. A bass that thinks it's a trout and water that's looks like a trout stream. A near-wilderness location that looks much like it did 200 years ago, but is within an hour of one of the largest metro areas in the US. 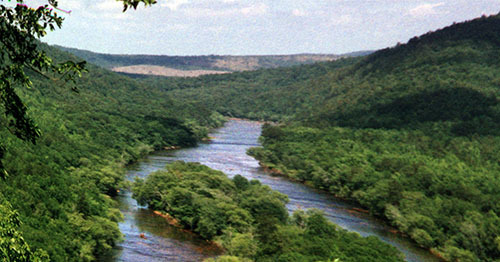 Beginning just south of Atlanta, the Flint River flows southward to join the Chattahoochee near the Florida line and form the Apalachicola River. Incredible though it may be, the Flint is one of only forty rivers in the United States that flows over 200 miles without a dam. And a magnificent river it is. Below the city of Atlanta, the Flint flows through a swampy, riparian floodplain that helps cleanse and purify the river. About 50 miles south of Atlanta, the Flint begins to drop through the lower piedmont and cuts through the broad Pine Mountain ridge formed from 550-million year-old crystalline rock forced to the surface by a geologic fault 30 to 50 million years ago. The results are quite unique - a rocky, mountainous area adjacent to the sandy coastal plain. The flora and fauna from both regions flourish. Spanish moss and needle palms grow adjacent to wild azaleas and rhododendron. Among numerous rare species, you also find Micropterus cataractae, the shoal bass. The shoal bass is found only in a few river drainages in Georgia, east Alabama, and north Florida. Habitat infringement has reduced their range considerably. 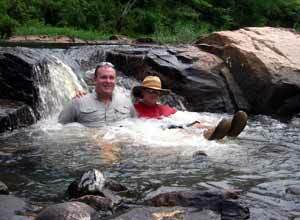 They require a free-flowing, rocky riverine environment, and in our insatiable quest for hydro-power and waterfront property, we have built dams on almost every river in sight. But here, the Flint still flows wild and free and the shoal bass flourish. The shoal bass shares the appearance and aggressiveness of the black basses. They eat almost anything that will fit in their big, wide mouth. They bust a topwater fly that invades their territory. When hooked, they make big, head-shaking leaps trying to throw the hook. But they share much with the trout family too. Shoal bass thrive in shallow rocky shoals. They lay up in the eddies and pockets adjacent to the fast currents, picking off prey in the flow and returning to their ambush spot. A trout fisherman will be right at home on the Flint - almost everything he does in fishing trout streams will be applicable here. The shoal bass was not recognized as a distinct species until 1999. 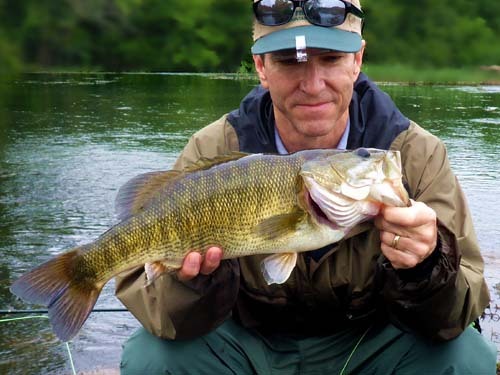 Previously it was considered a sub-strain of the red-eye bass, although many local anglers and scientists had long thought it a different fish. The shoal bass is not a big bass relative to largemouth standards. The world record is 8 lbs, 12 oz - that fish was caught on 10/23/77 in the Apalachicola, which is fed by the Flint and the Chattahoochee. The previous record that stood from 1977 was an 8 lb, 3 oz fish from the Flint. 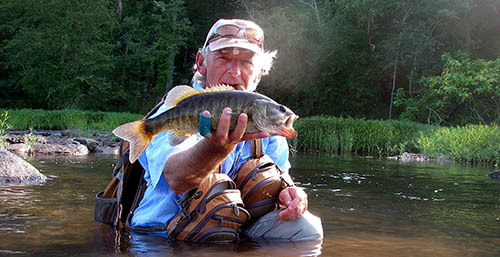 We've had 4 different anglers to get in the IGFA record book with Flint River shoal bass, some of them multiple times. Several other anglers have also completed the IGFA and the Georgia bass slam awards. The average shoal bass is probably 10"-12" with 16"-18" fish not uncommon. Anything larger is in the trophy neighborhood and will definitely earn bragging rights. But don't be fooled by its relatively small size - these fish are long and strong fighters who know how to use the currents. Next to them, the largemouth is a slacker! Almost all of the Flint below a highway crossing near Gay all the way to Lake Seminole has shoal bass but we fish the fall line area, the section where the Flint is shallow and rocky. Walk-in access to the Flint is very limited as most property is privately owned. Access is available at Sprewell Bluff State Park and Big Lazer Creek Wildlife Management Area. Access to this section of the Flint is available at highway crossings near Woodbury (GA Hwy 18), and below Manchester (GA Hwy 36 and Pobiddy Road). This middle section of the river is more suited to canoes than powered craft, though launching of small power boats is possible at these crossings - this is an option only when water levels are high and even then only for boats that can be dragged over rocks. Be careful as there are numerous shoals and slightly submerged rocks. Wading access is available at Sprewell Bluff State Park and Big Lazer Creek Wildlife Management Area. 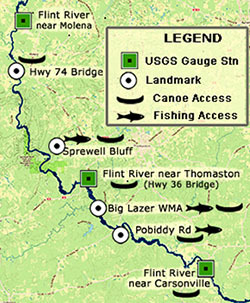 The best access for wade fishing the Flint is 3-Mile Shoals. 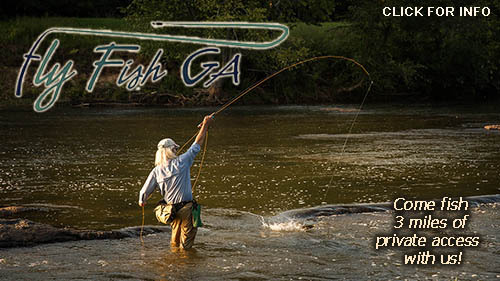 Fishing here is available exclusively on guided fly fishing trips with FlyFishGA. See more info at the bottom of this page. The Flint is a perfect river for canoe/kayak floats. 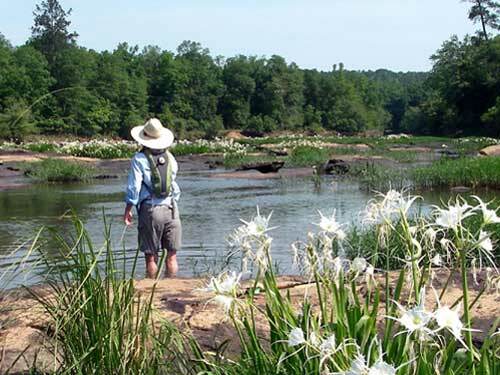 Flint River Outdoor Center (706-647-2633) is located on the river on Hwy 36. They rent canoes and provide shuttle service to & from various access points. The Flint is susceptible to blowing out with heavy rains. It usually takes 2-3 days for it to fall and clear. I look for stable or falling levels for 3 days in a row. You can check current water levels at this USGS site or on my weather & water page. A Flint old-timer told me one day that "thar's a bass up under ever' one of them rocks - all ya gotta do is get your bait to `em." The Flint has cracks, crevices and slots throughout its rocky bottom. In many places you could push your arm completely under a rock. The trout stream techniques of casting up or up-and-across and dead-drifting work well - this can be done with or without a strike indicator. I often use the a topwater bug as the indicator, drifting the flies through the current lanes. If a deeper slow pool has formed below the run I alternate twitches or pops with the dead-drift. Mend and allow the flies to drift all the way to the bottom of the pool - its bottom end will often be a undercut horizontal rock ledge and the shoalies love to lay here. With a weighted dropper below the stealth bomber, long strips will cause the stealth to dive quite deep and fish will often hit either fly (or both). I especially like the stealth in white because it is very visible even at depths. You can see the strike or sometimes see the fish flash without taking - this let's you know you need another drift through that spot. Sometimes, big shoal bass can be found in very skinny water. Don't neglect spots that might seem too shallow or lacking in water flow - centuries of up-and-down flows have created numerous holes and subterranean passages and the shoalies know them all. I make it a habit to always fish water (not matter how unlikely) before I wade through it or pass it by. On more than one occasion I have been shocked to find a fish where I least expected it. Shoal bass love the shoals - their Latin species name translates literally to "waterfall bass" - and fishing for them in the rocks and pocket water is great fun. But they will also be found in deeper water where rocks and shoals are not evident - it's likely they are there but just covered by water. Here you can fish the weighted streamers with up, down or down-and-across casts. Topwaters will sometimes pull a shoalie up from the depths too. For the fly angler, an assortment of flies will work. The Flint has good populations of mayflies, caddis and stoneflies, plus dragon and damsel flies. 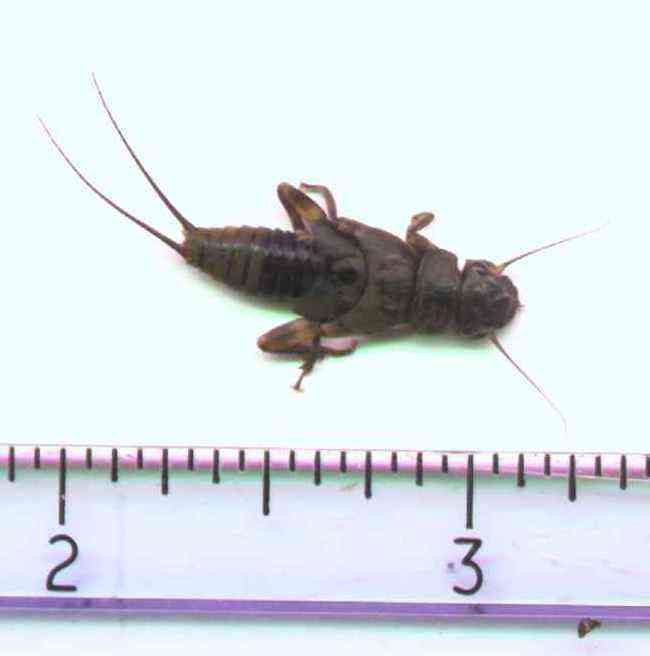 Very occasionally, there is a significant hatch that will really turn on the fish - a couple of times (in 25 years) I have gotten into big yellow stonefly hatches that were near mythical. A big stimulator works well even when there is no hatch. I used to fish a large elk-hair caddis and that worked fine too. Standard bass poppers and sliders work well too. The shoal bass acts a lot like a trout, but still has that inherent bass instinct to bash a topwater. My topwater fly is usually the Stealth Bomber tied with rubber legs. I often use a dropper 24"-36" below the topwater - Carter Nelson's Rubber Legged Dragon is my dropper of choice, though a black bugger is great too. Most streamers will work too - from small clousers up to something you might usually throw at stripers. I've had 10" fish eat 7" flies! Catfish, gar, and redbreast abound on the Flint. 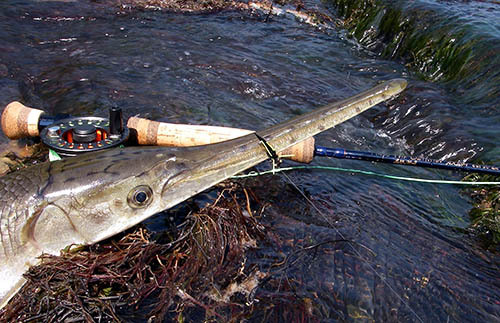 The gar are a blast and sometimes take a shoalie fly. Occasionally you will find crappie and white bass. 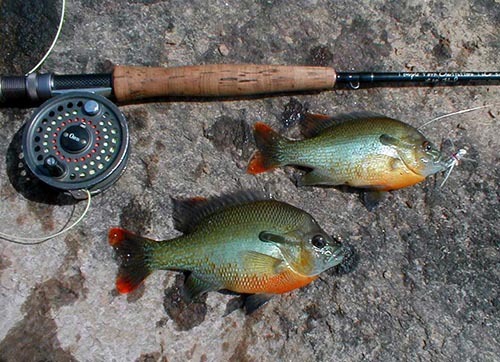 The red-breasted sunfish (or long ear sunfish) is a favorite of mine. They will grow quite large on the Flint and give that typical hard bream fight - but they are in the current so it's really a blast. The red-breast will take the same flies as the shoal bass. Sometimes they will be in the same water as the shoalie or perhaps in slower spots. Anywhere you see sand is apt to be a good red-breast spot. Fishing two flies will often result in a double hook-up (as shown at right) - these guys are nothing if not aggressive. Shoal bass can be caught all year long on the Flint, though winter may find them in deeper water and a bit less aggressive. My favorite time on the Flint is spring through fall. Beginning in late March or early April (as soon as the spring rains subside), you will find the big fish in the shoals. 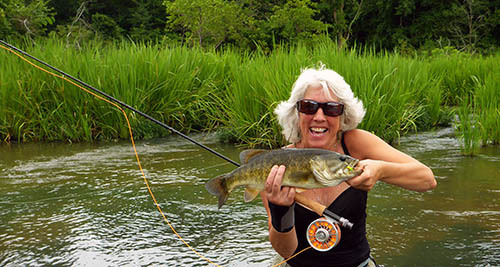 Water levels usually drop considerably in July and August but the fishing stays good. It is also a great time to learn the river, as the deeper holes and slots will be much more evident. And if you get too hot, just find a deep pool and cool off a bit. 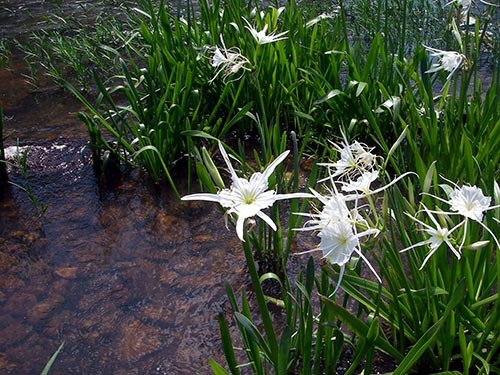 Summer also provides a beautiful show on the river - hundreds and hundreds of spider lilies in bloom. They flourish in the rocky shoals and are truly spectacular. So when the mountain trout are sulking in the heated water and the lake bass have all gone deep, wade the cool shoals of the Flint and enjoy our rarest native game fish. "Spanish moss and mountain laurel - where are we?" "Native fish in their native water...and they'll eat a topwater!" "I've fished all over the world - never seen a river like this..."
We're really happy to offer you the opportunity to fish this completely private water on the Flint River. Surrounded by 2600 acres of property, we have exclusive fishing rights to one of the longest and best set of shoals on the river. Virtually inaccessible, the only real access is by overnight paddlers who may pass through - most days, even on the weekend, we see no one. The 3 miles of river is nearly all wadeable water, varying from big runs and glides to small side channels and narrow runs through it's numerous grass beds. Most is waist deep or less, with much of it being calf deep. Though quite secluded, 4-wheel drive roads follow the whole length of the shoals, and we park our vehicle virtually on the river bank. Come fish 3-Mile Shoals with us. We've always thought it was the best stretch on the river, never imagining that we might someday have the exclusive privilege to fish there. Dreams do come true ,sometimes when you don't even dream them. Check Guided Trips for more info and rates. (There is no additional cost to fish 3-Mile Shoals with us).